Title: 02/03/1994 - Employers' responsibilities towards temporary employees. This is in response to your inquiry of May 3, concerning the Occupational Safety and Health Administration's Hazard Communication Standard (HCS), 29 CFR 1910.1200.
Who is responsible for hazard communication training of the temporary employee. The [temp] agency or the client employer? OSHA considers temporary employment agencies who send their own employees to work at other facilities to be employers whose employees may be exposed to hazards. Since it is your company, which maintains a continuing relationship with its employees, but another employer (the client) who creates and controls the hazards, there is a shared responsibility for assuring that your employees are protected from the workplace hazards. The client has the primary responsibility of such protection. The "lessor employer" likewise has a responsibility under the Occupational Safety and Health Act. In meeting the requirements of OSHA's Hazard Communication standard the lessor employer would, for example, be expected to provide the training and information requirements specified by the HCS section (h)(1). Client employers would then be responsible for providing site-specific training and would have the primary responsibility to control potential exposure conditions. The client, of course, may specify what qualifications are required for supplied personnel, including training in specific chemicals or personal protective equipment (PPE). Contracts with your client employer and your employees should clearly describe the responsibilities of both parties in order to ensure that all requirements of the regulation are met. 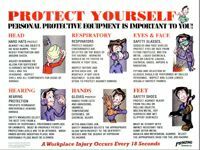 Who is responsible for the provision and assured use of appropriate personal protective equipment by the temporary employees? Client employers would be responsible for providing PPE for site- specific hazards to which employees may be exposed. However, again, the client may specify the services that it wants the lessor employer to supply, including provision of PPE for the placed employees. Contracts with the client employer should clearly describe the responsibilities of both parties in order to ensure that all requirements of OSHA's regulations are met. When medical surveillance or monitoring is indicated, who is responsible for conducting the monitoring and maintaining records? The client employer must offer and perform the required medical surveillance or evaluations. The lessor employer must ensure that the records of the required medical surveillance or evaluations are maintained in accordance with the appropriate OSHA standards. Is the temporary help service required to maintain cumulative exposure data (eg. 30 day lead exposure, 6 months noise exposure, etc. ), when the employee works for several different companies during the year? Yes, the temporary help service must maintain employee records in accordance with the appropriate OSHA standard (e.g. the Lead standard, the Occupational Noise Exposure standard, etc.). However, the client employer must perform the site characterization and monitoring of exposure to hazardous chemicals on the work site. If 29 CFR 1910.1200(h) requires training on hazardous chemicals in the work area at the time of the initial assignment and whenever a new hazard was introduced into their work place, when does the initial assignment begin and who is responsible for the initial training and the on-going training? The lessor employer would be expected to provide some generic training and client employers would be responsible for providing site-specific training, or training to update employees on new hazards in the workplace. Please see the answer to question 1 for a further explanation. How does hazard communication training tie into the SIC code 7363? The current HCS final rule covers all Standard Industrial Classification (SIC) codes. In 1987 the Office of Management and Budget (OMB) prevented OSHA from enforcing HCS in the construction industry. On OMB's advice, OSHA published a statement of concurrence in the Federal Register on August 8, 1988 (Volume 53, page 29822). However, on August 19, 1988, the U.S. Court of Appeals for the Third Circuit invalidated OMB's actions as being outside OMB's authority under the Paperwork Reduction Act (see United Steelworkers of America v. Pendergrass, 855 F.2d 108, (3rd Cir. 1988), Ex. 4-190). As ordered by the Court, OSHA published a notice in the Federal Register on February 15, 1989 (Volume 54 page 6886) to inform affected employers and employees that all provisions of the HCS would be in effect in all industries, and set March 17, 1989, as the date for initiation of programmed compliance inspections. I am writing to you as requested by Tom Galassi of your office. I own a temporary service which provided industrial temporary employees to perform various tasks in different plants. There are several questions that I wish you could clarify for me. Who is responsible for hazard communication training of the temporary employee. The agency or the client employer? Who is responsible for the provision and assured use of appropriate personal protection equipment by the temporary employees? If 29 CFR 1910.1200(h) requires training on hazardous chemicals in the work area at the tire of the initial assignment and whenever a new hazard was introduced into their work place. When does the initial assignment begin and who is responsible for the initial training and the ongoing training? Your clarification of these questions would be appreciated.